Caddis flies make up a high proportion of the trout's diet in both rivers and natural lakes. A warm summer's evening is the best time to find fish taking the freshly emerged adults as they skitter across the water's surface, and is also the most effective time to use a well-tied imitation. 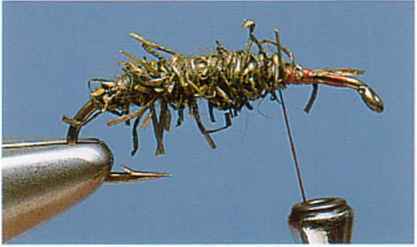 An adult caddis fly imitation needs to be retrieved to imitate the action of the natural, so it is important to tie it with buoyant materials that won't easily become waterlogged. The Cutwing Caddis fulfills this criterion by having a body and thorax made from dubbed deer hair, the natural buoyancy of which helps it to float. The lifelike profile of this fly comes from the wing, created by gluing a hackle feather to a sheet of fine nylon mesh. When dry, the feather may be cut to the typical caddis fly shape. 2 Using the standard finger-and-thumb twist, dub the deer hair onto the tying thread. If this proves difficult, apply a sticky wax to the thread first. Start to wind the dubbed hair along the shank. IOnce the hook is fixed in the vise, run the tying thread from the eye to a point opposite the barb. Tear rather than cut a pinch of olive deer hair from the skin and apply it to the tying thread. 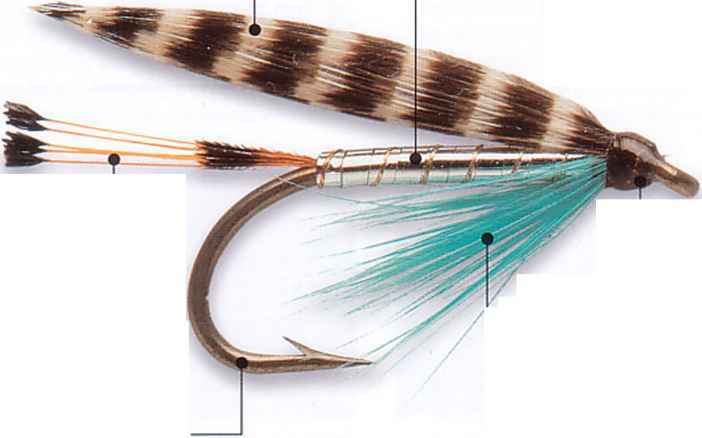 3 Cover two-thirds of the hook with the dubbed deer hair, aiming to form a relatively fat body. 4 Select a pre-prepared wing that has been cut to the shape of a caddis fly wing. These are formed by gluing a hackle feather to a fine nylon mesh before cutting to the required shape. 5 Press the wing so that it folds along its central rib, then catch it in position at the eye so that it wraps around the sides of the body. 6 Tear a pinch of dyed brown deer hair and place it in a dubbing loop. Spin the loop before winding the hair on as a combined thorax and hackle. Twist a few fibers to give the impression of leg joints. Cast off the thread. Where dry flies imitate all those creatures to be found on the water's surface, nymphs and bugs provide the subsurface equivalent. Patterns that fall within this category include those that either suggest or directly imitate the nymphs and larvae of all the main aquatic fly groups, including mayflies, stoneflies, caddis flies, and midges, plus the smaller species of freshwater crustaceans. However, many nymph patterns are tied simply to provide an impression of something alive and edible. Interestingly, this latter group includes many of the most successful of all nymphs, patterns such as the Hare's Ear Nymph, the Pheasant Tail Nymph, and the Fox Squirrel Nymph. The vast majority of the trout's prey is found among the weeds and stones on river bottoms. For this reason, many nymphs and bugs are weighted so that they sink quickly to the fish's feeding level. To accomplish this sink rate, additional weight can be added to a heavy-wire hook by using materials such as lead wire, lead foil, or metal beads. Metal beads come more somber-colored lead wire and foil is normally applied directly to the hook so that it remains hidden under the fly's body materials. By concealing the weight under the dressing, imitations of creatures, such as caddis larvae and scuds, can be tied with plenty of weight while still looking lifelike enough to fool the fish. 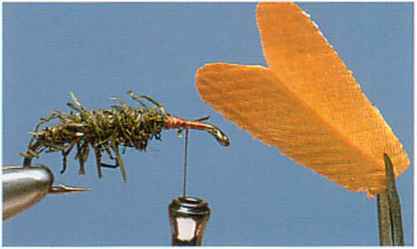 How to tie wing on caddisfly? 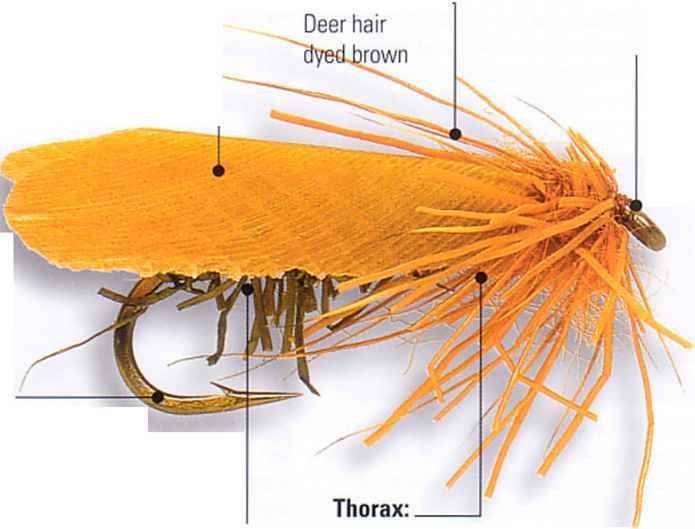 How to tie a wing caddis fly?